Memorial to the 27 graduates of Father Judge High School who were killed in action during the Vietnam War. In the history of the Vietnam War, Father Judge and Cardinal Dougherty High Schools once shared an unenviable record: Each lost more graduates than any other Catholic or private school in America. 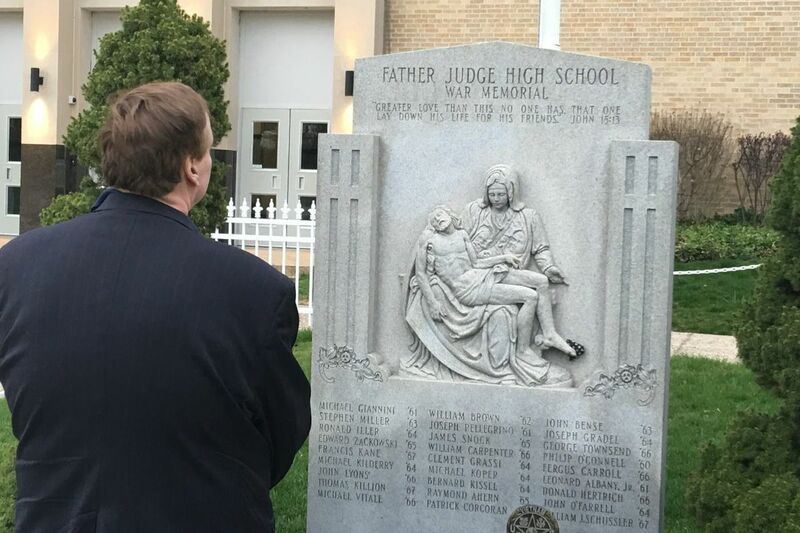 When the Archdiocese of Philadelphia closed Dougherty a little less than a decade ago, that grim distinction became Father Judge's alone among still-existing parochial schools. From the Classes of 1961 through '68, a total of 27 young men from the all-boys Holmesburg school were killed in action, ripping a hole in the heart of not only their alma mater but also the Northeast Philadelphia neighborhood they left behind. At the entrance, a large granite monument carved with their names and Michelangelo's Pieta is a steadfast reminder of a community's sacrifice. Jim Kirlin, though, wants more. Also a Father Judge grad and a Vietnam veteran, he is producing a documentary about his "brothers" who died in Southeast Asia. "Nobody has really told the full story of the 27," said Kirlin, 71. "What's really compelling about this is families are saying this is helping them heal, because nobody has talked to them in 50 years." Kirlin, a financial adviser for the last 30 years, fought in Vietnam in 1966 and '67. "I served in the Marine Corps and in the infantry and I survived," he said. "That's the easiest way I can explain it." About five years ago, having watched the Northeast change demographically and culturally into a diverse patchwork of varying economic classes and beliefs, he decided to find a way to preserve the memory of those soldiers so their sacrifice wouldn't be lost to time. Through stops and starts, the project moved forward, and last year Kirlin started interviewing families of the dead, as well as living veterans from the area. The film, independent of the school, is being produced by Irish American Films, a Philadelphia-based movie and TV production company that focuses on Irish American contributions to the culture. The producers set up a GoFundMe for help raising $30,000 to complete the film, which they are hoping will "knit together" the narrative of the war's impact on the school specifically, and the Northeast generally. Shawn Swords, director of operations at Irish American Films, said the documentary will focus on the soldiers but will also touch on student life at Father Judge before and during the war. And it will examine how the school and the Northeast changed when so many of their sons didn't return home. Surviving families and friends "also suffered," Kirlin said. "And that's becoming a narrative of its own." The release of the Father Judge documentary, according to Kirlin, is targeted for November to coincide with Veterans Day. "The Vietnam War, for a lot of us, was shoved in the background," Kirlin said. "And we want to pull it back up."